Sufficient levels of muscle strength, defined as the maximal force an individual is capable of exerting during a voluntary contraction, is a critical component to overall physical health and well-being. Muscle strength generally increases with age throughout childhood and adolescence. This book discusses specific methods of assessment and factors affecting muscle strength in children. In addition, many other factors including gender and physical activity levels have previously been reported to affect the structure or metabolic characteristics of skeletal muscle. 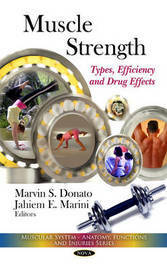 This book reviews the literature describing the maladaptations that occur in skeletal muscle in response to the most common lifestyle associated chronic diseases and discusses the mechanisms behind the maladaptations, as well as potential therapies to halt or reverse the changes. This book also examines the impact of ageing on muscle strength, as well as reviews the physiological and mechanical properties of muscle architecture essential to the production of muscle force under different loading conditions.